I met Li-fang Tang, director of the Yunlin County Storyhouse, through her husband, James Radant, an English professor at National Yunlin University of Science and Technology, who was producing our musical. James and Li-fang had arranged for me to give presentations at the university and the Storyhouse. 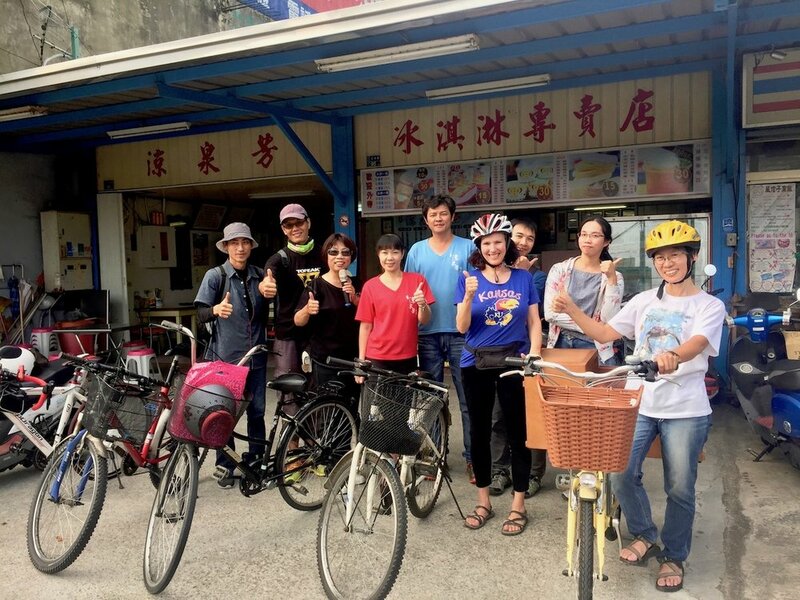 Since my visit coincided with the Storyhouse’s annual storytelling bike tour, Li-fang invited me to participate in that too. At almost sixty, Li-fang was trim and vigorous. Her dark hair, lightly threaded with silver, was cut in a chin-length bob, and her eyes, behind John Lennon glasses, were warm and vital. Born in Taiwan, she’d spent much of her adult life in the U.S., working as a scientific researcher and a registered nurse. She and James returned to Taiwan when their daughter Mishun was a toddler and James landed the position at Yunlin Tech. When Mishun was little, Li-fang put her to sleep with bedtime stories. After the family moved back to Taiwan, Mishun came home from preschool one day upset because her classmates said the stories weren’t true. She wanted Li-fang to come to her class and tell the other children the stories so that they, too, would believe. So she opened the Yunlin Storyhouse. The building is an elegant Japanese-style construction with low ceilings and sliding wooden doors, which served as government housing when Taiwan was under Japanese colonial rule. Events, both planned and spontaneous, take place daily. There are storytelling and craft activities; visiting and local authors read and sign books. Occasional plays take place in the evenings; musicians play in the courtyard in the afternoons. Other rooms hold exhibits by local artists and a small library. The Storyhouse also offers picture book workshops, where kindergarteners through octogenarians write and illustrate their own books. Like everything else at the Storyhouse, the workshops are free. Li-fang doesn’t solicit money from individuals to fund the Storyhouse; they come to her. The bikes are donated by a local bike shop. Artisans contribute lamps, furniture, and artwork. The only place she actively solicits donations is the government. Li-fang is not a person whose demands you ignore. Each year the Storyhouse selects eight to ten of the books developed in their workshops to publish in hardcover, then features four or five of those on their annual bicycle tour. In 2016, featured authors included a prominent local artist and an eleven-year-old boy. In 2016 they collected sixty people’s stories and published them in a single book. This volume embodies the Storyhouse’s vision of acting as a collective memory bank while honoring the dignity and importance of each individual voice. During my week with the bike tour, we took day trips to surrounding areas, presenting books and stories to over 2000 people. Audiences ranged in size from around 500 (at a high school) to twelve (at a senior center). We also visited preschools, day care centers, and a mall. Li-fang rode a large, old-fashioned bike with a wooden box attached. In the box, she carried copies of the featured books, a basket of candy, two wooden blocks, and a kamishibai—a wooden frame with a painted canvas scroll and a hand-crank, which provides illustrations for the stories. These objects harkened back to a traditional form of storytelling—originally from China but popularized by the Japanese during their colonization of Taiwan—in which storytellers biked through the countryside, peddling stories and sweets, clapping wooden blocks in the town square to gather an audience. In an era in which we spend so much time staring at screens, Li-Fang uses these tools to bring people back to the basics of storytelling: humans together, sharing experience. Since most of our audiences didn’t speak English, Li-Fang interpreted my stories into Mandarin. At first this made me anxious. I’m a writer. Words, their weight and specificity, are important to me. When I worked as an actor and solo performer, I always preferred scripted material to improv. Yet here I was, not just telling unscripted stories, but having my words restated by someone else. But Li-fang reminded me that the story gives rise to the words, not the other way around. Looking at the rapt faces of my audiences, watching their eyes dart from me to Li-fang and back again, I relaxed. This wasn’t about me; it was about the story. Li-Fang has traveled the world, telling stories and discussing the Storyhouse’s work in more than 20 countries across Asia, Europe, North and South America, and Australia. Wherever she goes, the view is the same: people of all ages gaze at her with open eyes, ears, and hearts. Is it a stretch to think that, in a world of screaming ideologues, this kind of deep listening has the power to heal and transform? After standing beside Li-Fang and seeing those upturned faces, I was ready to believe. I returned from Taiwan revitalized, with a renewed commitment to repair our broken world, one story at a time. What's your story? Off-leash writing can help you discover and name what compels you. Four-session Bay Area workshop begins June 23. REGISTER HERE or subscribe to be notified of future in-person and online classes. Closing night of "The Fourth Messenger" at Yunlin Tech.